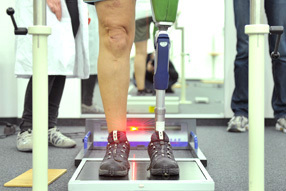 The Master's degree in Sports/Rehab Engineering, leading to a Master of Science, is intended for sports scientists, sports therapists, engineers, natural scientists, former professional athletes, trainers (associations and Olympic training centres), graduate orthopaedic technicians as well as interested medical technicians. The aim of the Master's degree is to advance interdisciplinary research and development in the sports goods and equipment sector as well as rehabilitation technology based on sound engineering science knowledge and to actively promote top-level sport at training centres through up-to-date sports goods. The professional development Master's degree in Sports/Rehab Engineering lasts 3 semesters and is worth 60 ECTS. If, based on your prior education, you do not have the necessary ECTS, there are bridging courses in which you can acquire them prior to commencing your studies. You can complete the study programme alongside your work within three semesters. The practice blocks take place in the PFH's Zentrum für Healthcare Technology (ZHT) (Centre for Healthcare Technology). This research and study centre with its seminar rooms and fully equipped workshop for orthopaedic technology is directly located in the building of the Göttingen University Clinic, Some other courses take place at PFH's Göttingen campus. The study programme is accredited and state-recognised. The study programme in sports/rehab engineering approaches the topic area from three angles: orthobionics, business sciences and engineering sciences. Well-founded material sciences knowledge, technical expertise and good understanding of human motility patterns help to develop ideas regarding efficient athlete care in practice and to implement them successfully in an interdisciplinary team. You will thus acquire an understanding of the latest developments in the field from an application and a technical perspective. Furthermore, you will prepare yourself for being able to carry out business assessments and business start-ups in your profession. Our new Master's degree therefore offers you a highly promising opportunity to acquire professional specialisation. The entry requirement for the Master's programme is an initial professional qualification with a minimum of 240 ECTS credits, which is also equivalent to a Diplom. The PFH offers a one-semester or two-semester bridge course for Bachelor graduates from the cited or cognate disciplines with a qualification having a minimum of 180 ECTS credits. This will enable you to achieve both the content requirements and the formal qualification. The programme of the bridge course includes medicine, the natural and engineering sciences, business administration content and applications relating to professional practice. This will provide you with intensive and practically oriented preparation for the Master's programme in sports/rehab engineering as well as for subsequent professional fields. During the bridge course, you will already be enrolled as a Master's student in order to ensure that, upon successful completion, you have a seamless transition to the Master's study programme. The bridge course can be customised to existing achievements and knowledge. Participants and University analyse together which courses are relevant and interesting. This results in a personally tailored course offering. The PFH offers both on-campus modules and practicals and, in the business administration subjects, distance learning courses, which stem from accredited and state-recognised study programmes. An overview of the modules available for selection can be found here. Three one-week blocks per semester, additional 12-14 weekends during the first two semesters. Why Study at a Private University?